The school year is rolling around quickly and remember last year? Hectic mornings, kids frantically running around the house with no shirt on, misplaced school forms, missed breakfasts etc. It might take some time now to change and start organizing but you will save loads of time later. Follow these tips and you will not only get your kids to school on time but have an incredibly successful year and increased harmony at home. An easy way to start is by setting your kids’ sleep schedules back to “school time” two weeks before their first day, in 15 minute increments. This will help your kids get used to going to bed earlier so that waking up early isn’t an issue. Coming home to piles of clothes all over the floor or running late to school because of a wardrobe malfunction is a nightmare but you can make sure it never happens. Make sure to do your summer cleaning — put away the summer clothes and or donate the clothes that kids have outgrown. Before putting away summer clothing, wash or dry-clean them to avoid stains and store in garment-bags to avoid damage from moths. This will give you one less thing to do. Designate ‘Outfit of the Day’ cubbies. Kelly, a mom of two, suggests using a hanging clothes organizer. 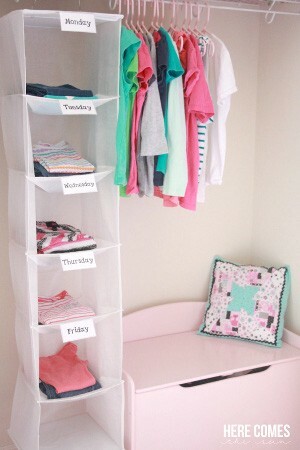 Super easy to implement and this way your kids can get in the routine of separating out their clothes for each day the night before. With all the arts & crafts the kids bring home, by the end of the year, our homes will be art galleries. An easy way to declutter and stay organized is with the Keepy app. Just take a picture of your kid’s artwork and the app creates a digital scrapbook for each of your children which you can share with their grandparents and other loved ones. You can also have your children tell a story about their masterpiece by adding a voice recording or a video to each upload. 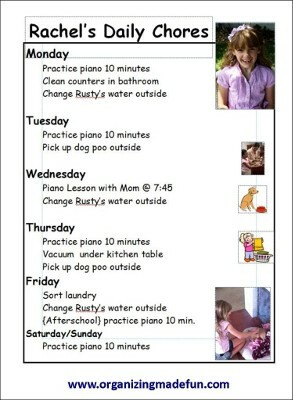 Family calendar that tracks everyone’s activities, commitments, days off of school and major events or exams at school. This will help family members avoid schedule conflict. Cheat sheet with emergency numbers for police/fire, phone numbers for Mom & Dad at work, pediatricians, neighbors and babysitters. Section for each family member to leave notes for each other. Get your child in the habit of emptying his backpack before dinner and checking for important papers that he can pin on the board or clip to a clipboard for you to sign. It is important to set up a “Homework Station” so your children are creating a homework routine and developing study habits that will help them thrive at school. This station should be a quiet place with few distractions and have essential school supplies and materials nearby. 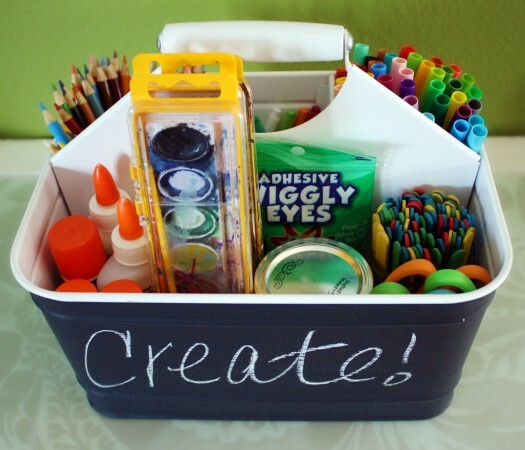 You can set up a caddy with all the typical school supplies so that they can just grab the supplies and bring them wherever they need to. 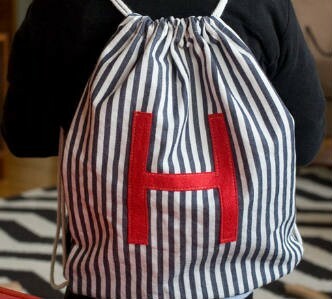 Chores will not only keep your home organized but more importantly, teach your kids responsibility. Each year the school will probably ask you for forms regarding your child’s emergency contact info, etc. Since nothing usually changes from year to year, it is handy to have each child’s forms saved electronically so the information is easily retrievable. Designate a bag for each child’s activity and on Sunday night, place whatever they need- the extra socks, ballet shoes, cleats etc, for their specific activity so that everything is ready to go in the morning. It’s normal to worry that you are implementing too much into your kid’s lives at once and that they will be overwhelmed. 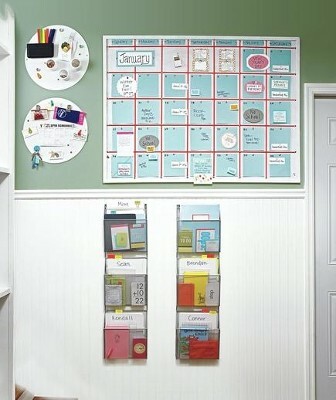 It will take time for the kids to adjust but during the weekly meetings, you can remind them of time management and how to use the family calendar and organization tools to plan ahead as well as check in and talk about what their weeks look like. Support and encourage them, everything ultimately will work out for the better. LASTLY, do something together as a family to relax before the busy year begins. Back to school can be a daunting time but once you get your child started in their daily routines, they will better handle this school year and everything else in the future.